The larger wooden cigar boxes are meant for the finer brands of cigars where they remain fresh for the guests who come to spend their vacation at this fishing lodge located along the Eagle River in Southern Labrador. After a long day of fishing and a fine meal, nothing tastes better than a cigar accompanied by a glass of port overlooking the Eagle River from the porch of the Rifflin'Hitch Lodge. Cigar Box and Port in the porch Rifflin'Hitch Lodge in Southern Labrador, Labrador, Newfoundland Labrador, Canada. 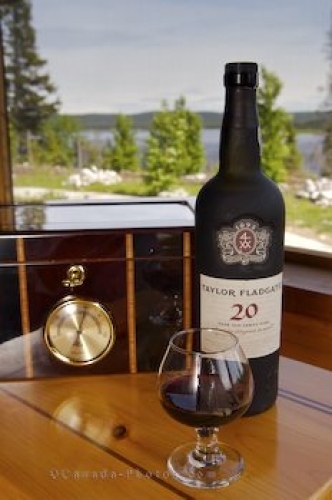 Photo of a wooden cigar box and a glass of port at a fishing lodge in Southern Labrador.